The first typewriter was mass produced in the 1870’s. The original QWERTY layout minimized frequently used pairs of keys from being positioned side-by-side. When adjacent keys were pressed in close succession, they tended to jam on each other. The QWERTY layout was, in fact, an attempt to increase typing speed. 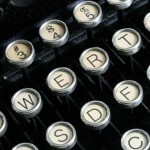 Current keyboards don’t have the same mechanical obstacles of typewriters. However, the QWERTY layout has endured. Interestingly, with the evolution from typewriters to computers, mice and numeric keypads have been integrated in a desire for increased speed. For some workers, their layout can contribute to fatigue and discomfort.